Today was one of those rarest of days - an empty cinema. Right up to the point where a second person shambled in. Which wouldn't have ruined the experience, but for them taking the time to check their ticket to make sure they sat in exactly the right seat. Which, of course, was the one behind mine. Typical. Fortunately the shuffling, sniffing and rustling of a carrier bag stopped just as the opening scenes of Get On Up came grooving onto the screen. Taking the lead role is the great Chadwick Boseman - last seen in 42 - and, this being a biopic n all, the success of the film mostly hangs on his performance. 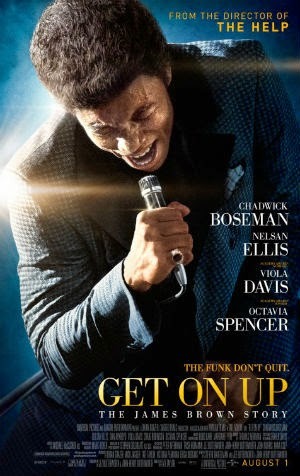 From a young James stuck in "pokey" for stealing a suit from a car to an older man reclaiming his former glories, Boseman brings the troubled Godfather Of Soul to life in such a way that you can't help but warm to him. Which is no mean feat, given how unlikeable Mr Brown became as his success grew. Alongside him is Nelson Ellis, off of True Blood, who more than holds his own as Mr Brown's longtime No2 and old friend Bobby Byrd. The film starts with the events that were to lead to Mr Brown's infamous arrest following a car chase with the police, before taking us back and forth through the years, leaping from one point to the next with no linear structure. Once you get used to this, you can settle into and informative, well-told biopic that puts it's focus on the music far more than the man. That's not to say his drug use, treatment of women and issues with fellow musicians aren't touched on, but they really do play second fiddle to the hits and building of a legend. Which is fine as far as it goes, but the songs are so well known it would have been good to focus more on the stories behind them. Sure, we find out (over several inter-cut scenes) about Mr Brown's formative years, but simply telling Bobby to hire Bootsie (Collins - ask yer dad) when his band walks out on him (and then not dwelling on how he came back from financial ruin) feels like a beat missed. And those aren't the only problems here. A well-worn cinematic device to denote the passing of time is used on several occasions for seemingly no reason other then the look of the thing, while the breaking of the fourth wall is slightly out of kilter with the tone of the movie as a whole. And switching to the original recordings instead of letting Boseman handle vocal duties was also a mis-step, as the clearly audible switch detracted from his fine on-stage performances. But there are more positives than negatives. The music is obviously stand-out, but it's the rest of the cast that catch the eye and the heart. Dan Ackroyd, as Mr Brown's long-time agent Ben Bart, is spot-on, while Viola Davis' portrayal of Mr Brown's mother is simply stunning. If Wikipedia is to be believed, writers Jez and John-Henry Butterworth play fast and loose with the actual time-line, but speaking as someone who didn't know that while watching the film it's only going to be an issue for the real aficionados. Director Tate Taylor may like doing some things for the sake of it, but in terms of the tone and look of the film, he captures the different periods well. Could have done without inter-cutting scenes of Boseman's Mr Brown with the original TV show audience, but hey, I guess he had access to the footage and figured he ought to use it. A good biopic should, all being well, introduce you to something you didn't know about the subject - something which is tricky when Mr Brown lived out his life willingly in the public glare. He was ahead of his time in terms of the cult of celebrity as well as his music. But thanks to fine performances from the leading cast, you are introduced to something new - sympathy for a man who almost seemed to make being disliked his life's ambition. ...but, thanks to the power of Boseman's performance, you accept such things as the effects of a flawed genius, who took black music to the masses and gave us all his groove.